1) reflect 97% of solar energy back into space and reduce my air conditioning costs? 2) reflect 97% of radiant losses back into my home and reduce my heating costs? Imagine reducing summer air-conditioning costs 35% and winter heating costs 20% simply by covering a home’s attic insulation with thin, light-weight, inexpensive aluminum-plated leaflets. Reflective aluminum simultaneously places a home in deep shade and covers it with a “space blanket”. With reflectors in place, most people are comfortable with thermostats set 3° F higher in summer and 3° F lower during winter. Infrared energy radiating from sun travels 93 million miles through the vacuum of space before it reaches the earth. Here, it strikes a surface and either 1) becomes heat or 2) is reflected back into space. Unfortunately, most building materials are very poor reflectors. They absorb about 90% of infrared energy, becoming hot in the process, and reflect a mere 10%. 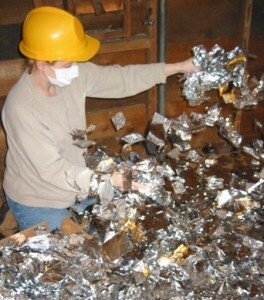 By contrast, aluminum absorbs 3% and reflects 97%. In short, aluminum remains cool in the sun and every material shaded by it remains cool. Once infrared (radiant) energy is converted to heat energy (molecular movement) it travels through matter by conduction. Conventional insulation (dead air spaces encapsulated in poor conductors), no matter their R-values, merely slow the rate of heat flow. Aluminum infrared reflectors reverse the direction of IR radiation. Reflected IR energy is not converted to heat, so the home’s insulation heat-burden is reduced by 97%. Reinforced aluminized polypropylene roll goods are available on the web. Rolls of “Radiant Barrier” are commonly 4 feet x 125 feet and cost about $100. In contrast to roll goods, aluminized polyester leaflets don’t require cutting, positioning and stapling in place – a two man job. 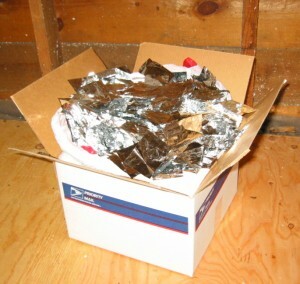 Leaflets can quickly and easily be broadcast over conventional attic insulation by one person.